A new prediction says 2017 and 2018 will see major Lyme disease outbreaks in new areas. This could lead to lifelong health consequences, so where’s the vaccine? BY THE time he had finished his walk through the woods in New York state, Rick Ostfeld was ready to declare a public health emergency. He could read the warning signs in the acorns that littered the forest floor – seeds of a chain of events that will culminate in an unprecedented outbreak of Lyme disease this year. Since that day in 2015, Ostfeld has been publicising the coming outbreak. Thanks to a changing climate it could be one of the worst on record: the ticks that carry the disease have been found in places where it has never before been a problem – and where most people don’t know how to respond. The danger zone isn’t confined to the US: similar signs are flagging potential outbreaks in Europe. Polish researchers predict a major outbreak there in 2018. In theory, Ostfeld’s early warning system gives public health officials a two-year window to prepare. In many other cases, this would be enough time to roll out a vaccination programme. But there is no human vaccine for Lyme disease. Why not? And what can you do to protect yourself in the meantime? Lyme disease is the most common infection following a pest bite in the US: the Centers for Disease Control estimates that 300,000 Americans contract Lyme disease each year, calling it “a major US public health problem”. While it is easy enough to treat if caught early, we are still getting to grips with lifelong health problems that can stem from not catching it in time (see “Do I have Lyme disease?“). 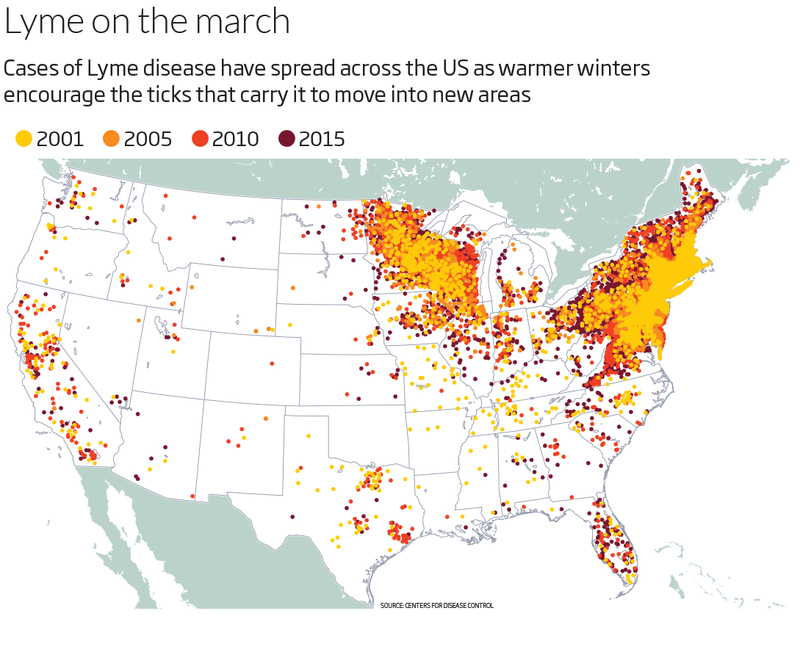 This is less of a problem when Lyme is confined to a few small areas of the US, but thanks in part to warmer winters, the disease is spreading beyond its usual territory, extending across the US (see map) and into Europe and forested areas of Asia. In Europe in particular, confirmed cases have been steadily rising for 30 years – today, the World Health Organization estimates that 65,000 people get Lyme disease each year in the region. In the UK, 2000 to 3000 cases are diagnosed each year, up tenfold from 2001, estimates the UK’s National Health Service. So how could a floor of acorns two years ago tell Ostfeld, a disease ecologist at the Cary Institute of Ecosystem Studies in Millbrook, New York, that 2017 would see an outbreak of Lyme disease? It’s all down to what happens next. A bumper crop of the seeds – “like you were walking on ball bearings” – comes along every two to five years in Millbrook. Crucially, these nutrient-packed meals swell the mouse population: “2016 was a real mouse plague of a year,” he says. And mouse plagues bring tick plagues. Soon after hatching, young ticks start “questing” – grasping onto grasses or leaves with their hind legs and waving their forelegs, ready to hitch a ride on whatever passes by, usually a mouse. Once on board, the feast begins. Just one mouse can carry hundreds of immature ticks in their post-larval nymph stage. This is where the problems for us start. 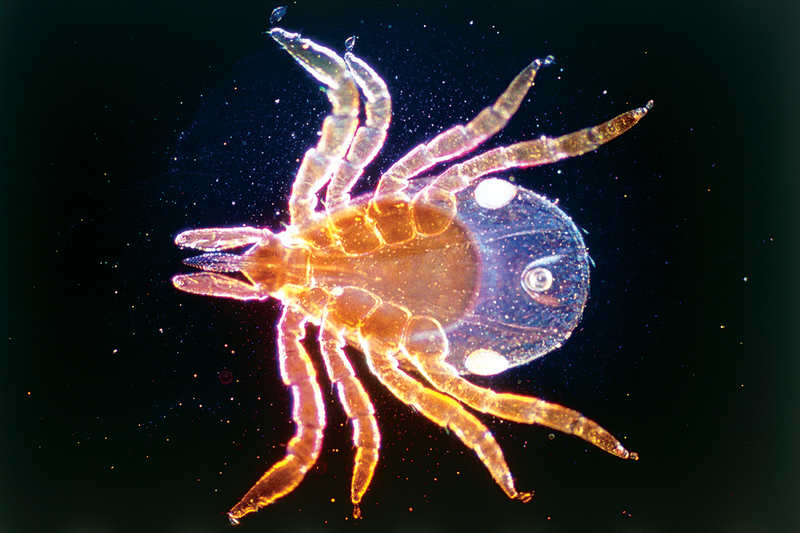 Mouse blood carries the Lyme-causing bacterium Borrelia burgdorferi, which passes to a tick’s gut as it feeds. The tick itself is unharmed, but each time it latches onto a new host to feed, the bacteria can move from its gut to the blood – including that of any human passers-by. “We predict the mice population based on the acorns and we predict infected nymph ticks with the mice numbers. Each step has a one year lag,” Ostfeld says. Ostfeld published his discovery of this chain of causation in 2006. Last year, researchers in Poland found the same trend there, with the same implications. “Last year we had a lot of oak acorns, so we might expect 2018 will pose a high risk of Lyme,” says Jakub Szymkowiak at Adam Mickiewicz University in Poznan, Poland. It’s not obvious when you have been bitten or infected: ticks are the size of a poppy seed, and not everyone gets the classic “bullseye” rash that is supposed to tip you off. The flu-like symptoms that follow are also easy to misdiagnose. And because antibodies to Lyme disease take a few weeks to develop, early tests can miss it. “That’s when you get late-stage, untreated, supremely problematic Lyme disease,” Ostfeld says. The best approach would be to vaccinate people at risk – but there is currently no vaccine. We used to have one, but thanks to anti-vaccination activists, that is no longer the case. In the late 1990s, a race was on to make the first Lyme disease vaccine. By December 1998, the US Food and Drug Administration approved the release of Lymerix, developed by SmithKline Beecham, now GSK. But the company voluntarily withdrew the drug after only four years. This followed a series of lawsuits – including one where recipients claimed Lymerix caused chronic arthritis. Influenced by now-discredited research purporting to show a link between the MMR vaccine and autism, activists raised the question of whether the Lyme disease vaccine could cause arthritis. But there was a control group – the rest of the US population. And when the FDA reviewed the vaccine’s adverse event reports in a retrospective study, they found only 905 reports for 1.4 million doses. Still, the damage was done, and the vaccine was benched. After that, “no one touched it”, says Thomas Lingelbach, CEO at Valneva, a biotech company based in France. Until now: Valneva has a vaccine in early human trials. It will improve on Lymerix, acting against all five strains of the disease instead of just the one most common in the US, and it will be suitable for children. Lingelbach knows the battles his firm will face. “It will be hard to convince anti-vax lobbyists,” he says. That fight is still some way off: any public roll-out is at least six years away. What makes this wait especially galling for some is that there is a vaccine for your pet. “It’s ironic that you can vaccinate your animal and you can’t vaccinate yourself,” Plotkin says. In the animal vaccine, instead of exposing Fido to a weakened version of the antigen to trigger antibodies, it works within the tick, neutralising B. burgdorferi by altering the expression of a protein on the bacterium before it enters the bloodstream. This is how a human version would work. “The underlying scientific principle is not very far away from what it is in the veterinary environment,” says Lingelbach. Some people have suggested taking the animal vaccine, but Plotkin doesn’t recommend this as it hasn’t been tested in people so there is insufficient safety data. “You just don’t have classical efficacy data in humans,” he says. It is also illegal in the US and UK for vets to practise medicine on humans. While we wait for a human vaccine, you might start keeping track of your local acorn populations – but brush up on your anti-tick measures before you hit the woods. DO I HAVE LYME DISEASE? The symptoms of Lyme disease, which you can get from a tick bite, aren’t always obvious. At the site of the bite, a red splotch will often start to grow into what looks like a bullseye target. Not everyone gets this unmistakable sign, however. Over the next few weeks, flu-like symptoms, including aches and fever, can follow. Left untreated, Lyme disease can lead to a host of problems, chronic joint inflammation, facial palsy, issues with short-term memory, heart rhythm irregularities, and inflammation of the brain and spinal cord. The best way to prevent Lyme disease is to do a thorough tick check. Nymph ticks are so tiny they can be hard to spot, so find a partner, strip down, and go over places that are hard to reach. Make sure you check your partner’s armpits, scalp and groin for ticks. If you know it has been on you for under 36 hours, use tweezers to pull it out correctly, and you will probably be fine. That’s because the Lyme-causing bacteria that live in a tick’s gut are slow, and it takes 36 to 48 hours for them to make it into your bloodstream. Always see a doctor if you are unsure. It’s best to see a doctor for a Lyme disease test – but not right away. Your antibodies to Lyme disease take weeks to form, so an early test can give a false reassurance. Wait four to six weeks before requesting a blood test. If you do test positive for Lyme disease, a course of antibiotics will usually stop the infection in its tracks fairly quickly. A small percentage of people who are treated will continue to have symptoms like fatigue or sore joints and muscles. This condition is called post-treatment Lyme disease syndrome, sometimes referred to as chronic Lyme disease. It isn’t exactly clear what causes these symptoms, it could be a delayed immune response or even another illness altogether. Until this controversial area of medicine is clarified, it’s best to avoid getting Lyme disease in the first place, at least while a vaccine is still in development. We have corrected how to pull out a tick, and recalled the correct classification of mites.